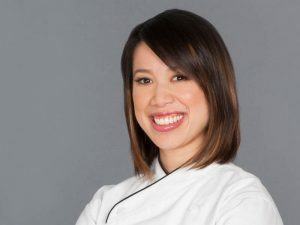 Christine Ha, winner of Fox’s Master Chef in 2012 never set out to be a cook. In fact, as a young girl she had no interest in cooking at all. Hear all about how becoming Master Chef changed her life. Including launching her latest venture; The Blind Goat. A restaurant or Chef Station in a new Houston Texas Food Hall. Christine’s story shows us how advocacy takes various forms. Plus lots of valuable information for anyone adapting to a life change. Whats up Reid My Mind Radio family, glad to be with you again. If you are new here, my name is T.Reid. impacted by blindness or low vision. Occasionally I include stories about my personal experiences with vision loss. Coming up today, I had the privilege of speaking with a young lady who took the subject of vision loss prime time. That’s right after we get a taste of some of this delicious theme music! In 2012 Christine Ha was studying creative writing in graduate school. of the Fox series Master Chef. from desserts to main courses. giving the winner a chance to publish their own cookbook as well as a cash prize. As a writer, as an artist, you are always trying to experience everything you can in life. And so I thought well there are auditions are coming to a nearby town like why not if anything I have some interesting stories to write about. I went just going for the experience not thinking that I would get as far as I did. Along with the prizes she became synonymous with the title The Blind Cook. I lost my vision because of an autoimmune condition called Neuromyelitis Optica or NMO for short. It’s similar to multiple sclerosis so my immune system attacks minor logical system primarily the optic nerves in the spinal cord. There were many times when I had an NMO attacks that involved paralysis. I would lose feeling in my feet or my hands I’ve had a time when my attack on my spinal cord was very bad where I was completely paralyzed from the neck down for several weeks and at the same time I was also experiencing optic nerve inflammation so I was also losing my vision couldn’t see anything, couldn’t move, couldn’t sit up by myself, couldn’t feed myself, couldn’t grip my tooth brush, hold my glass of water, lots of things. So that was a big challenge in my life and that was around the time when I was in my early twenties. Fortunately, I’ve been able to recover quite well from a lot of the spinal cord inflammation. As though one were to come out of a very hot shower and looked into a steamy mirror, that’s what I see. So, washed out colors some shapes some shadows very blurry vision I would say in both of my eyes. I still managed to go back to school and get my master’s degree in creative writing after I lost my vision. Christine was never planning on becoming a Master Chef. moving out of the dorm in college. I realized that I had to learn to cook in order to feed myself because I couldn’t afford to always eat out. I decided to buy a cookbook and read the recipes and then just buy some cheap kitchen equipment and teach myself. And I just read the recipes word for word and experimented in the kitchen. Also the fact that I missed a lot of the food that I grew up eating, Vietnamese food, since I’m being amused by heritage my mom was a very good cook but she never taught me how to cook. She was actually very overprotective mom and wouldn’t let me near the knives or the hot stove and I really wasn’t that interested in cooking as a child. And I just thought that everyone ate good food and I took my mom’s home cooking for granted and she actually passed away when I was fourteen and I think when I was older in college I realized what I had missed out on learning to cook from her. So I started reading a lot of Vietnamese cookbooks and trying to reproduce a lot of the dishes that I recall eating growing up in her home. Knowing that I was able to create something with raw ingredients and be able to keep the people around me that I cared about and have them enjoy something that I actually created with my own two hands, that kind of ignited my enjoyment and passion for cooking. And so it was that moment on that I wanted to learn everything I could about food in cooking so I read tons of cookbooks practice a lot of different things in the kitchen just tried my hand at. All kinds of cuisines and it just kind of grew from there and it was interesting Lee end up the same time that I started losing my vision because of the enemy so I was slowly losing my vision at the same time that I was excelling at cooking it always felt like I had to really learn how to cook like every few months or every couple years I would have to really learn how to do things with less vision in the kitchen. It always felt like I had to start over every time my vision decreased so I felt defeated quite a bit throughout these years. What made you keep on going? Living life in the best way possible doesn’t mean problem free. Christine identifies some real benefits of going through adversity. You can say life changing. How did it feel when you won? That was kind of a bizarre experience at the beginning and it took me a while to get used to that but the upside was I’ve had so many opportunities since winning Master Chef that have been amazing. I’ve been able to travel around the world and and do work with the U.S. embassy in culinary exchange programs, advocate for entrepreneurship women’s rights and the rights of those with vision impairment and people with disabilities, do things with Asian American focus groups so all of these things have been really amazing in just the experiences I’ve been able to have like judging Master Chef Vietnam or you know having my own cooking show geared towards the visually impaired called 4 Senses in Canada. All these things would not have happened if I wasn’t on Master Chef. I’m really excited because finally this follow opening I very first restaurant in Houston and that’s been a dream of mine and it’s finally coming true as well. It’s called the Blind Goat it’s coming into a newly built hall that’s very chef driven in Houston so the food hall craze is finally coming to Houston I know it’s you know a thing in New York it’s a thing in L.A. and thing in San Francisco. A Food Hall is typically a mix of local artisan restaurants, butcher shops and other food-oriented boutiques under one roof. A food hall is not the same as food courts found in malls as that consists of fast food chains. It’s called the Blind Goat because obviously I am vision impaired and goat is my zodiac sign in Vietnamese astrology so I’m born the year of the goat. So I thought that was kind of a cute and fun name and the cuisine that we’re going to be serving there will be largely southeast of Vietnamese style. And it’s kind of like small plates, I would call it a Vietnamese gastropod so kind of shareable small plates that consist of food that you would want to eat and share with friends over a beer or over a glass of wine. Communal eating is kind of the theme and this is something that I’ve always believed in and the food and ingredients that so I’m very excited to be opening up the place and sharing it with the world. Are you familiar with the acronym the goat? I didn’t know but then someone said does that stand for greatest of all time and I was like that is really funny I never heard of that before but now I will have to use that. But do you have another acronym? No that was it the greatest of all time L.L. Cool J. had his whole album he refers to himself as that as the goat and some people when you talk about your top five well you know that type of thing a top five artist you say oh this was the goat. There you go, run with it [laughs]. Christine co-hosted a cooking show produced by Accessible Media Inc in Canada. They wanted to do some original programming and of course I was the natural fit because I can cook and I’m vision impaired. I co-hosted it with Carl Heinrich who won Top Chef Canada and he’s a fully sighted chef professional chef and I’m sort of the amateur home cook that’s vision impaired and we co-hosted the show. It’s a show that geared towards not only vision impaired cooks but also novice cooks or just anyone who wants to get back in the kitchen and learn about cooking. But of course it really was heavily year towards people who have lost their vision and want to learn to cook again or who just want to be getting learning how to cook our show had audio description embedded within the program so we were very descriptive it was almost like you could listen to radio while you were watching our show. We wouldn’t use things like “oh you put this in there” you would say you’re putting the salt inside the pot that contained the chili and of course the recipes were available online in an accessible format. Four Senses ran for 4 seasons and is still available online. Christine’s working on a new cookbook right now. When I first learned to cook I would follow a recipe to a tee and if it said to put you know something in the oven for forty five minutes I would do it even if like everything was smoking and it was obviously over cooking and burning. I think that’s kind of the wrong approach to cooking, everyone’s equipment’s different ingredients or different elevation that you’re cooking and that affects like how things cook so I want to write a cookbook that helps people hone in on their own intuition and cook using all of our availale senses. Oh yeah there’s nothing wrong with that at all. It’s very convenient to just dump everything into the pot and walk away and then you’ll have a good smelling meal later. If you’re imagining that Christine’s kitchen is full of high tech gadgetry , you may be surprised. it’s really more about organization. I have a baking bin so that will whole my baking soda, baking powder vanilla extract, vanilla pods, sugar. And then I’ll have another bin that’s my coffee bin so that will hold the coffee beans, like the Arrow press, the coffee filters. My spices are organized. I have everything in my pantry actually on a list using the our groceries app on my iPhone I can just read down the list using voiceover and know everything I have in the kitchen so I can meal plan that way. When we run out of milk or something I can move that to the grocery list and then we know when we go shopping I share the list with my husband and he can see on a list we need milk so he can grab the milk. So that’s kind of you know the adaptations I had in the kitchen. I have an Amazon echo which I love to set timers for different things I’m cooking, to do quick conversions standard measurements to metric, and of course I love listening to music while I cook. What’s the music you listen to while you’re cooking. I actually listen to all sorts of stuff. So I listen to a lot of classic rock I grew up listening to The Beatles because my parents love the Beatles so I listen to classic rock, I listen to a lot of indie rock, alternative rock. You know I’m a child of the eighty’s and ninety’s so I do like some new wave and some eighty’s pop, British pop, ninety’s of course like the grunge rock alternative rock from that and then there’s also like ninety’s hip hop I grew up listening to quite a broad spectrum of things. Jazz to me is relaxing so I’ll put on just jazz music maybe more of the mainstream country but not like a lot of the country music and not a lot of the heavy metal stuff. Not mad at her at all. but through her work she’s an advocate. half baked stereotypes about what it means to be blind. Non apolegetically walking through life with her white cane in hand striving towards her goals. visually impaired and in general people with disabilities. Like she does through her TEDx talks which you can see online. TED is an acronym for technology, engineering and design. consider how people who are blind or visually impaired access information, websites and more. Lets Cook By Eatting First. becoming a better eatter and subsequently better cook. I think that’s a really good point you have there Thomas I think that I originally wrote those points for cooking but they’re definitely applicable to many other things in life. For example try everything and try everything twice. I think that’s important because you really don’t know what you like or what you prefer or what your talent could be if you don’t try everything. I had a huge fear of public speaking but I had a lot of opportunities to public speaking after Master Chef so I decided why not I should conquer that fear because you never know what it could lead to and I did. I kept doing public speaking even though at the beginning I was sweating and my voice was shaking and I was extremely nervous but I just kept doing more and more and more until it became more comfortable. And the good that’s come out of it is that my story has touched a lot of people inspired people experience life that goes hand in hand with traveling I think a lot of times especially as Americans because our continent is so large we don’t travel far. We’re fortunate that we can get so many things here within our country you know. I live in Houston which is now the most diverse city in America so I can get Mexican authentic Mexican street tacos I can get Ethiopian food, I can get the VIetnamese, Chinese food French food, whatever. All those things are available pretty much within my city so I’m fortunate in that way. But I think sometimes we’re so comfortable that we don’t want to leave our comfort zone so we choose not to travel and learn about other cultures and when I do travel and I meet other people and I learn about their culture whether it’s through their food, how they interact with others, how they live their lives, the news that they receive, way that they dress, the things that they like to do to pass their time. I learn a lot about another culture and then it teaches me that I’m quite small very insignificant dot on this earth and that you know I’m just part of this bigger world with so many other people equally as important special as I am. I think it helps you keep an open mind as well we get so hung up on our politics and our way of lives here in America that I think it’s important to remember that you know our way is not always the only way. Beginning this fall, if you’re near Houston Texas make sure you check out the Blind Goat. a Food Hall currently being built. her cooking show 4 Senses online at ami.ca . Her cookbook Recipes from My Home Kitchen is available from Amazon in print and EBook Kindle edition. And you can always visit her online at TheBlindCook.com where you’ll find links to her social media and her latest blog posts. I went just going for the experience not thinking I would get as far as I did. Did you notice that when I mentioned I was a crock pot cooker, Christine didn’t make fun of me. She showed no signs at all of putting me down or superiority. I’ve experienced this in the past as if cooking in a crock pot made sense simply because I am blind. Christine showed no signs of that. She was cool! I cook on a stove. Both before and after vision loss. pretty strict regarding my environment. I obviously need to know where everything is and need things labeled properly. I like it very organized and clutter free. I also like being alone. I don’t want to be watched unless I’m doing a cooking show. I should check this or stir that. My response will most likely be to let them have at it. Call me when it’s ready! cooking is a learning process. When learning anything you’re going to have some failures or setbacks. Cooking as a metaphor actually illustrates this very easily. Christine mentioned how when learning to cook in college, she threw away a lot of meals. This Master Chef made things that weren’t edible during her early days. What are you currently in the process of learning? An instrument, a new function on the job? Whatever it is you are going to cook up some meals that you are not going to want to serve to your friends and family. You have to, its part of the early process. This same advice applies to vision loss and the process of learning to adapt. You are going to have setbacks at times but stay with it. As long as you’re cooking you’re headed in the right direction. Are you in the kitchen? Here’s a recipe for a quick meal that is sure to satisfy. It’s called Reid My Mind Radio Gumbo. Apple Podcast, Google Play, Sound Cloud, Stitcher or Tune In Radio. Then just hit the button that says “Subscribe”. That’s it. The dish is served up every two weeks and I personally think they are scrumptious! Perfect for any meal or snack. You can even serve to others. I’m just sayin! You smell that… somethings burning! I think I overcooked that metaphor. Posted by T.Reid	on Aug 1st, 2018	and is filed under Access Technology, Accessibility, Advocacy, Audio, Blind Tech, Blindness, Descriptive Television, General, Media, Visually Impaired, Web Access.